I came across this article written from some brave soul who forced himself to look up the vomit-pail statement of the Communist Party USA, and was amazed at how utterly identical the communists’ statement was to the Democrats’. 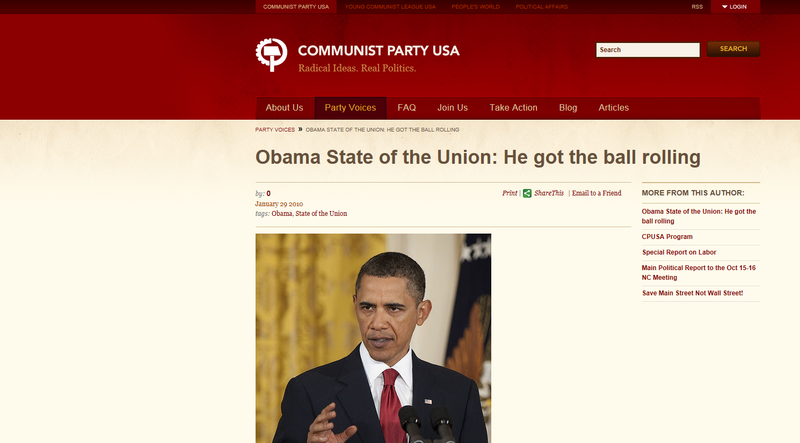 The Communist Party USA has issued a statement on Obama’s “Health care victory”. That means if you opposed Obamacare, you are in the minority and don’t count. That means physically confronting the “Tea Party” movement with union goons, thugs etc. Ordinary patriotic Americans are now “far right” and “racist hate-mongers” didn’t you know? Almost certainly both staged propaganda incidents. “Tea Partiers” will be smeared at every opportunity. Immigration “reform”, greater union power, “cap and trade”, running down the military………. I’ll just deal with one major correction: that the “fascists” are the conservatives. Baloney. Nazi stood for “National Socialist German Workers Party.” They were socialists, which is to say they were leftists. Just like the the folks who ran the “Union of Soviet Socialist Republics” were leftists. The Nazis, by the way, had a national health care system that looks very much like the one that the Democrats, and of course the communists, are trying to create here. And one can look at the Nazi Party Platform and see some uncomfortable similarities. The right to a job; the right to national health care; the right of the government to confiscate corporate profits, and the right to divide corporate profits; the right to a Social-Security-like welfare; the right of land reform and the right to confiscate land in the name of the people; the right to education that has been fundamentally reconstructed by the state; the right to a state-controlled media (i.e., a Nazi fairness doctrine); the right to suppress religious freedom in the name of advancing the agenda of the secular state; and, lastly, the right to have a strong central government be formed. Gosh, but that sounds an awful lot like the Democrats, and an awful little like the Republicans. I’ve been listening to the Democrats’ rhetoric, and now I come across this, and the communist rhetoric and the Democrat rhetoric is nearly word-for-word identical. Just kind of shows you what Republicans are REALLY up against.